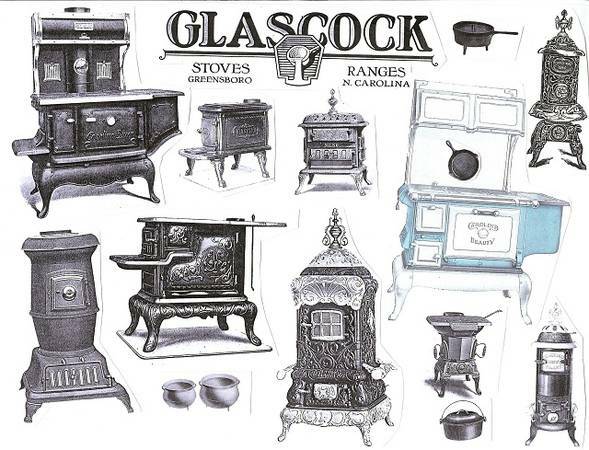 WANTED: Wood & Coal Stoves, Heater, Cast Iron Pots, Skillets, Old Catalogs, Literature, Ads Etc. made by Glascock in Greensboro. Also interested in items made by Eagle Foundry in Greensboro and Victor Stove Works in High Point NC. Some of the Common Model Names: Black Bird, Blue Ridge, Carbon Banner, Carolina, Carolina Beauty, Carolina Globe, Carolina Hot Blast, Carolina Oak, Carolina Pride, Carolina Queen, Cavalier, Charter, Cheerful, Giant, Victor, Victor Gem, Victor Junior, Paramount, Piedmont, Plymouth, Tar Heel etc. Buying Glascock products in ANY condition. PLEASE send photos of what you have. - THANKS!! Even if your Glascock product is NOT for sale, I'd like to hear what you have and add it to my list of Glascock products still around. THANKS!